My daughter suffered a serious house fire today. She’s ok, but things are in shambles. From now through the end of May, the proceeds from this pattern will go towards helping her re-build and be whole again. What an awful thing to go through. I can’t even begin to imagine the heartbreak of losing prized belongings and irreplaceable memories. So, in a pay-it-forward spirit I’m going to purchase and give away 4 copies of this pattern to you all! All you have to do is leave a comment with the two colors you would use for this shawl and why you’d choose those colors. 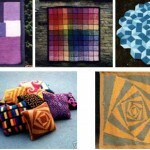 I always have a difficult time choosing multiple colors for a single project so I’m looking for a little inspiration. The fine print – one entry per person. The contest will run until next Saturday April 21st, and I’ll announce the winners next Sunday April 22nd. I’ll send the winners a copy of the pattern as a gift via Ravelry so I think you’ll need a Rav account. If you don’t have a Rav account and you win we’ll figure something out. Rav forum post about remedying rowing out – I loved the “helicopter method” to address excess yarn. Ingenious! 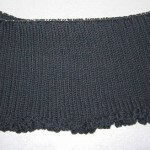 Another Rav forum post listing mostly garter shawls. I discovered a lot of new shawl patterns and I love the simplicity of garter stitch for my commute. Spatterdash wristwarmers showed up in my friends’ activity this week. How did I miss these? Great for variegated yarns (or tonals too) and love all the little buttons. What a beautiful pattern and how nice of you to purchase the copies to help the designer after this tragedy. Tough to choose from all the Madelinetosh colors, but I’d probably pick Burnished and either Copper Penny or Nutmeg. Lovely pattern and such a good cause. They make me think about the calming effect of the sea lapping on a sandy shore. Beautiful shawl pattern. I would choose dark purple and teal. I just love these 2 colors together. Not sure what yarn I would, I will need to find the perfect shade of dark purple. 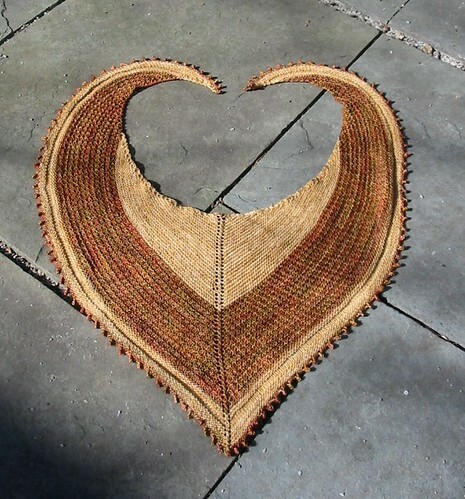 Jodie, thanks for letting us know about this lovely shawl and the good cause. Don’t enter me in the contest – I just now purchased the pattern on Ravelry. Just wanted to say a big “thanks” to you for giving us the o to assist someone in need. I seem to be in a purple phase right now, so purples and greys would probably be my combo. Happy knits everyone! oh how beautiful! I think I’d have to go further with the heart theme and maybe do a two-tone red, with the darker red in the center – maybe Tanis Fiber Arts in Sunset and Poppy. I think it’s wonderful that you’re helping people out. This is very sweet of you! I think I’m going to have to gift a few around myself. I’ve had this pattern in my queue for a while, but haven’t really thought of colors. Definitely a light paired with a dark for good contrast. Maybe a light grey with burgandy or dark purple.. or dark grey with a light blue. The shawl is adorable. that’s one of my favorite shapes because it stays on your shoulders without much fuss. I also have a difficult time choosing colors for multicolored projects. Inevitably, I choose shades of grey. But I love grey so I’m never disappointed with the results. Lovely gift… I’d use a malabrigo sock or Arroyo color like Jupiter or Candombe and a solid picked from one of the colors in the variegated skein. I would make it in 2 colors of Plucky Knitter yarn ( was just at her retreat) a beautiful dark grey and a rich cobalt blue. I’d use purple and green, but then again, I usually use purple and green for anything. A beautiful shawl pattern that I would make in shades of green. How sweet to pay it forward. Happy Birthday! I have a lot of green sock yarn so I think I’d fiddle with the pattern a little. I have a beautiful green/yellow varigated (more subtle than I make it sound) and some solid green that I bought at stitches years ago. I think that would be magnificant together! I love purple and pale springtime green at the moment! 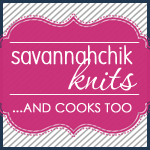 I can’t suggest a brand but I love Tanis Fiber Arts!! Happy birthday! What a lovely thing for you to do. What a great idea! Me? I would need an ocean blue and lime green. Soothing and calming! Happy Birthday! What a great cause and how very generous you are to do this for YOUR day. I love shades of peach so a dark peach with a very pale shade for the edging. I also love shades of pinky/purple so those for a second one? LOL Wishing you the best and prayers and good thoughts sent to the designer’s daughter and family. What a fantastic shawl. I love the way the top curls around. Hmmm what colours would I make it in. Well it would have to be a deep purple and then a lighter lilac colur, just because I LOVE purple. This is a gorgeous pattern. And is so nice of you to do a giveaway for a good cause. I would love to knit this yellow/mustard and grey. Just because those are my latest favorite colors. Thank you for this great opportunity. The shawl is stunning. I’d choose Byzantine and Magnolia Leaf – not my usual colours, but this stunning shawl deserves something special. Thank you for offering the opportunity to win this lovely pattern. The shawl looks wonderful, but the colors, that’s hard. I think I would go for a dark almost black blue and a royal purple. I think the contrast would be very nice. I’m on a huge Madelinetosh kick, I think happiness and silver fox would be lovely. Looking at the iris in bloom in my yard, I would go with a dark and light purple combo! Flash dance and something like nostalgia. I’m really digging browns and pinks together at the moment so I’d probably go for that. I’m also a major fan of teal and light sandy brown too. Brilliant idea! And what a lovely design. My fingers are crossed, but if I don’t win I’ll have to purchase it anyway. Thanks for bringing a beautiful design and a good cause to my attention. Beautiful, I agree with everyone else! Thanks for the giveaway. It’s a very pretty shawl (it’s in my Ravelry faves) and to be honest, I have no idea what color I would use to make one. I just bought the perfect yarn for your scarf. It will be here on Monday or Tuesday. . .I could start it right away as I sit in the radiology office waiting for my honey (he will be fine; very small bit of cancer) and while I am giving final exams next week. Hope I win, if not I will buy.